Research within this theme includes landscape-scale surveys of communities or populations of threatened species, long-term demographic monitoring of iconic or indicator species, active management of red-listed species in situations of conflict with development, and studies of space and habitat use using remote sensing techniques. 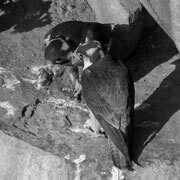 Andrew Jenkins has been studying Peregrine Falcons in the Greater Cape Town area since the late 1980s, initially as a PhD student at the FitzPatrick Institute, UCT, and more recently as a Research Associate of the Institute. 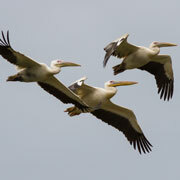 The study has focused on individually colour-marking as many of the adult birds in the population as possible, as well as the majority of young produced each year, and monitoring survival, dispersal, and breeding success of these marked birds in relation to a variety of potential biotic and abiotic drivers. The study has now accumulated over two decades of detailed demographic data, and has documented a more than five-fold increase in the size of the population over that time, including a major expansion of breeding birds into the deep urban areas of the city. Andrew is currently collaborating with Accoc. Prof. Res Altwegg of the Dept of Statistical Sciences at UCT, and Drs Petra Sumasgutner and Arjun Amar of the FitzPatrick Institute, in analysing and publishing aspects of this study. 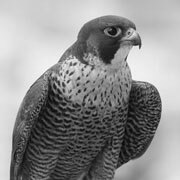 The SA Taita Falcon Survey Team operates under the auspices of BirdLife South Africa, and is recognised as the global Species Guardian for the Taita Falcon by BirdLife International’s Preventing Extinctions Programme. The Team conducts annual Taita Falcon surveys in the Mpumalanga/Limpopo escarpment area, and is trying to generate similar levels of interest in this hyper-rare and globally threatened species in other parts of its African range. Andrew Jenkins is a founding member of the Team. Find out more about the Taita Falcon project. Megan Murgatroyd has been studying the distribution, breeding success and foraging ecology of Verreaux’s Eagles in two areas of the Western Cape Province since 2011. This work has been done as a PhD thesis registered at the Animal Demography Unit, UCT, and under the supervision of Prof. Les Underhill, Dr Arjun Amar and Andrew Jenkins. A unique aspect of this study has been the deployment of data-loggers on eagles, which provide spatially and temporally high-resolution tracks of their foraging and ranging behaviour. Megan is currently writing up this work and hopes to graduate before the end of 2015. 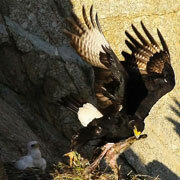 Find out more about Megan's work on Verreaux’s Eagles. 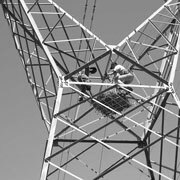 Jessie Berndt recently completed an MSc thesis on the significance of pylon-nesting for Martial Eagle conservation in South Africa. This project is registered at the FitzPatrick Institute, UCT, and was conducted under the supervision of Andrew Jenkins, and Drs Arjun Amar and Res Altwegg. 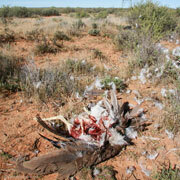 This work is a continuation of the Eskom/EWT Electric Eagle Project, and concludes that the long-term survival of this globally threatened raptor in South Africa may depend substantially on the effective management and conservation of pairs nesting on man-made structures in privately owned Karoo ranchland. 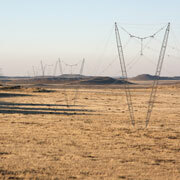 Find out more about Jess’s work on pylon-nesting Martial Eagles.